His name, perfect for a young, hard thrower, seemed the kind a novelist or screenwriter would conjure. Yet, Billy McCool was real, a left-hander who broke into the majors with the Reds as a teenager and for two years was among the top relievers in the National League. The Cardinals found McCool nearly untouchable in 1966, when he was a National League all-star. McCool battled the Cardinals for six seasons, 1964-69. He pitched more innings and had more strikeouts versus the Cardinals than he did against any other big-league opponent. In 1970, the Cardinals acquired McCool from the Padres. By then, McCool, 26, was struggling. He made 18 appearances for the 1970 Cardinals and was 0-3 with a 6.23 ERA and a save. This post is dedicated to McCool, 69, who died June 8, 2014, in Summerfield, Fla.
A standout athlete at Lawrenceburg, Ind., McCool was signed by the Reds as an amateur free agent in 1963. McCool, 19, made his big-league debut with the 1964 Reds and was a prominent pitcher for a club that fought the Cardinals and Phillies for the pennant through the final day of the season. McCool posted six wins and seven saves with a 2.42 ERA for the 1964 Reds. The Sporting News named him its National League Rookie Pitcher of the Year. Against the Cardinals that season, McCool was 0-2 with a save in six appearances. On Sept. 19, the Reds beat Bob Gibson and the Cardinals in the first game of a doubleheader at Cincinnati. McCool got his first big-league start (after 34 relief appearances) in the second game. Appearing in 62 games, including two starts, in 1965, McCool compiled nine wins and 21 saves for the Reds. He ranked second in the league in saves, behind the Cubs’ Ted Abernathy. McCool was 1-1 with four saves versus the Cardinals that season. Used exclusively in relief in 1966, McCool had eight wins, 18 saves and a 2.48 ERA. He again ranked second in the league in saves, behind the Dodgers’ Phil Regan. In seven games against the 1966 Cardinals, McCool was 2-1 with three saves and a 1.04 ERA. He struck out 23 Cardinals in 17.1 innings and yielded two earned runs. McCool made 11 starts in 31 appearances in 1967 and four starts in 30 appearances in 1968. He had two significant games against the 1968 Cardinals. Two months later, on June 14, McCool got a start at St. Louis. He held the Cardinals scoreless in six innings and limited them to two hits _ singles by Julian Javier and Tim McCarver _ and got the win in a 7-0 Reds triumph. Boxscore It was McCool’s last major-league win as a starter. Brock hit .147, 5-for-34, with 12 strikeouts against McCool in his career. Another Cardinals hitter who struggled versus McCool was Mike Shannon. He hit .100, 2-for-20, with seven strikeouts. 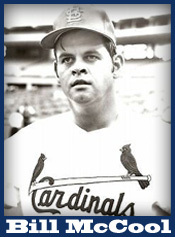 The Cardinals who hit McCool best: Javier at .400, 8-for-20, and Curt Flood at .292, 7-for-24. The Reds made McCool, 24, available in the expansion draft after the 1968 season and he was selected by the Padres. In four appearances for the Padres against the 1969 Cardinals, McCool was 2-1 with a 4.15 ERA. In April 1970, the Cardinals acquired McCool from the Padres for infielder Steve Huntz. After a stint at Class AAA Tulsa, McCool was promoted to the Cardinals in May. That was McCool’s highlight as a Cardinal. In July, he was demoted to Tulsa. After the season, the Cardinals traded him to the Red Sox for pitcher Bill Landis. McCool never returned to the major leagues. In seven big-league seasons, he posted a 32-42 record with 58 saves and a 3.59 ERA. In 33 games against the Cardinals, McCool was 6-6 with eight saves, a 3.26 ERA and 68 strikeouts in 66.1 innings.